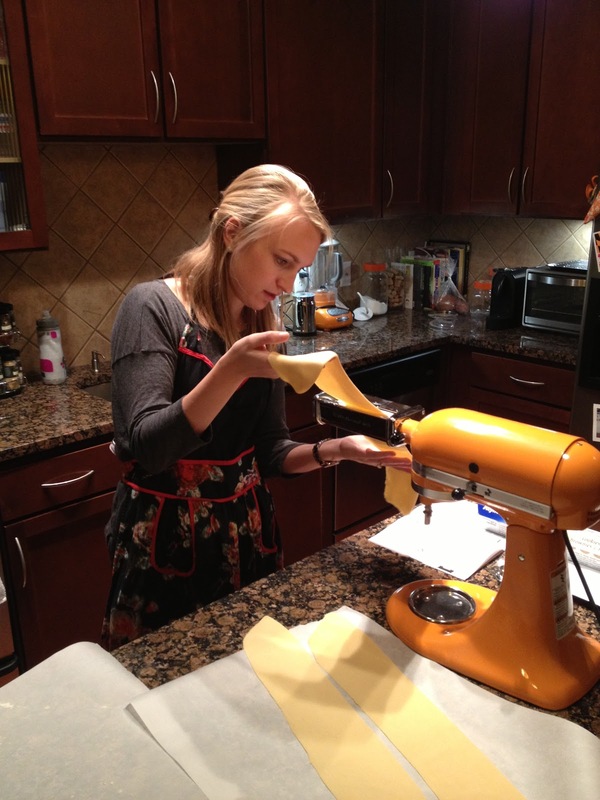 I was pumped to receive the KitchenAid pasta maker attachment for my birthday from my little sister! It was even funnier when the exact same thing showed up on our doorstep. First wedding registry present and we had to return it. But props to the little sis for being sneaky and not marking it off the registry! Of course, I knew we had tons of homemade pasta in our future. 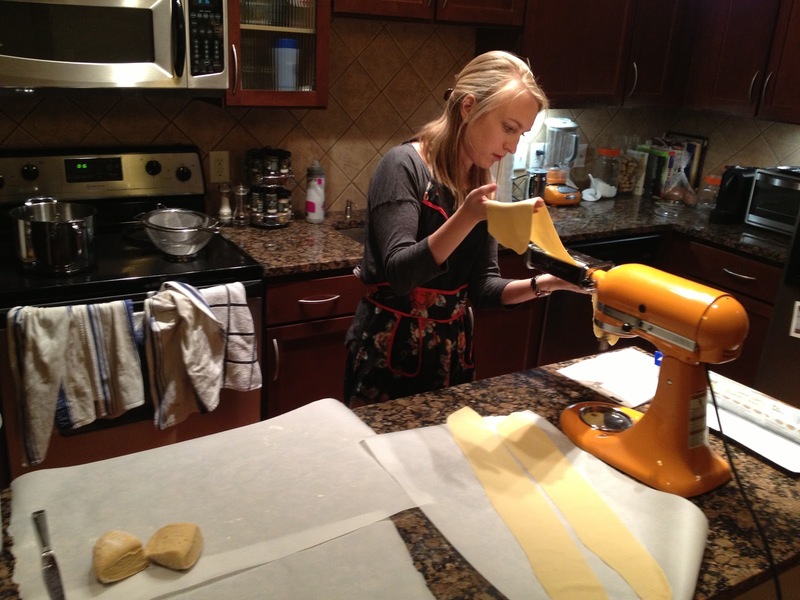 Fresh pasta is so incredibly delicious. It's amazing that flour and eggs can create such a delicious product. And so we set out to make a tasty meal of Shrimp Scampi with Homemade Fettuccine. 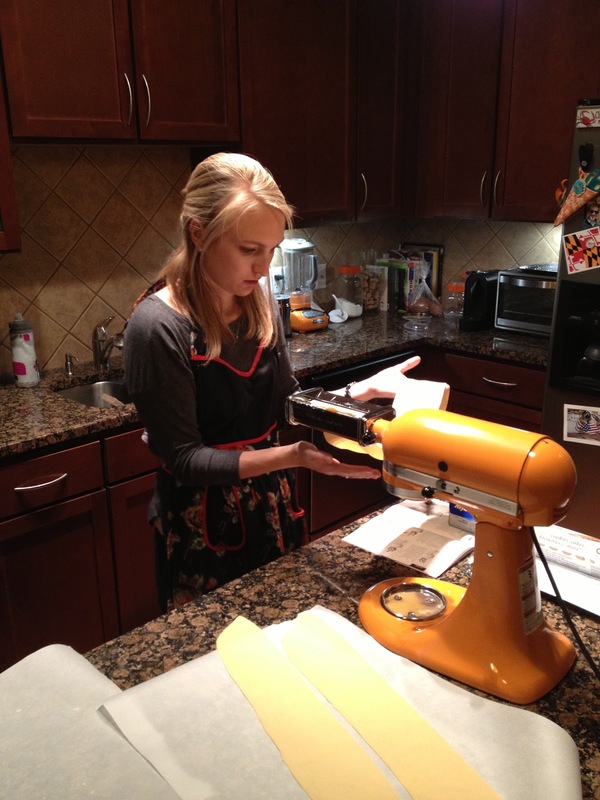 I prepared the dough before our marriage class last Sunday and then came home to lots of kneading, rolling and cutting. Combine all ingredients in the bowl of your stand mixer with paddle attachment. Mix on speed 2 for 30 seconds. Change to dough hook attachment. Knead for 2 minutes. Add a few drops of water to make the dough come together. Turn dough out onto a floured surface. Knead by hand for 2 minutes. Wrap tightly in plastic and let rest for at least 20 minutes. If prepared in advance, refrigerate until you're ready to roll it out. Divide dough into 8 even pieces. With your fingers, flatten dough into a long, narrow rectangle that is about 1 cm thick. With the roller attachment secured to your mixer, turn the dial to 1 and feed the dough through. Fold over and feed through again dusting with flour to prevent tearing or sticking. Continue to knead 3-4 times folding and turning. Turn dial to 2 and feed dough through. Do not fold anymore. Increase dial and feed through again. Follow manufactures instructions from here based on your desired noodle shape. 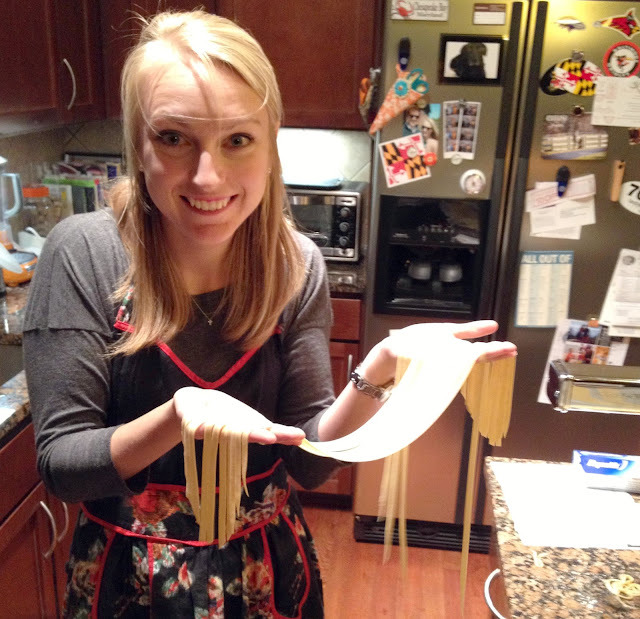 I stopped at 5 for our desired thickness of fettuccine. Lay the sheets out on parchment. Attach desired cutter attachment. Feed dough through carefully catching it on the other side. Fresh pasta only takes 2-3 minutes to cook in salted boiling water. If you're not cooking the noodles right away, let dry on parchment or paper towels for no more than an hour. 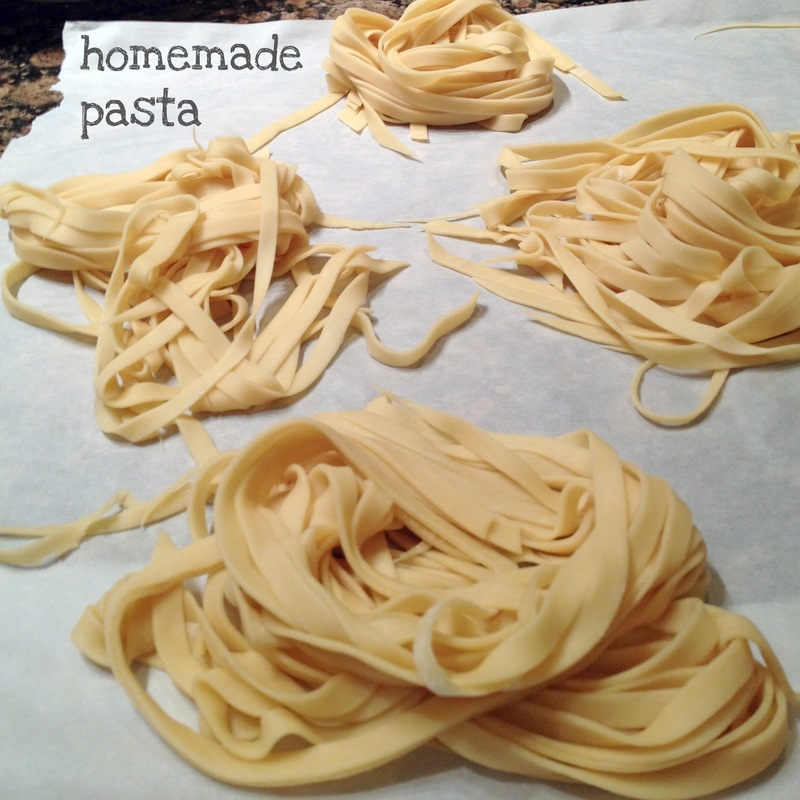 Curl noodles into nests and refrigerate in an airtight container for up to a week. You can also freeze the noodles in a similar manner.